This tramway line was built in summer of 1999. 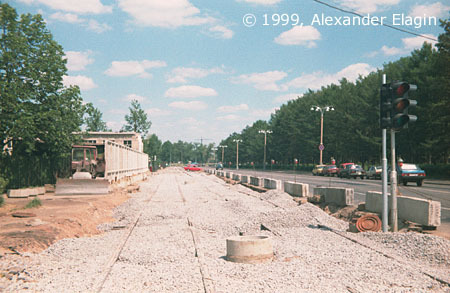 The reconstruction of Prospekt Mira highway caused the previously existed line to be closed, but it had long been clear that the service provided by trams on this line could not be replaced with other means of transportation. 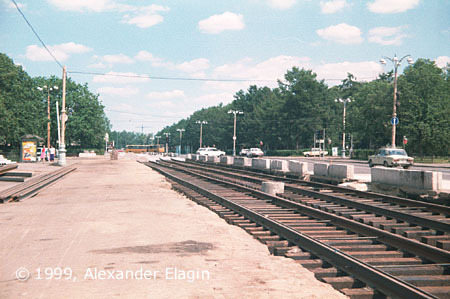 Finally it was decided that the tracks would be relocated to a parallel street named Prodolniy Proyezd, thus saving the line. New tracks are being laid along Prodolniy Proyezd. Rails and sleepers here are prepared for further construction works (see below). The next stage of tramline construction: now, prepared tracks are being covered with gravel until rails are hardly visible. Later the tracks would be aligned by slightly lifting rails with already tied sleepers, this job is performed by a special equipment. Ostankinskiy Proyezd. The new line to the left is not connected to the old one yet. 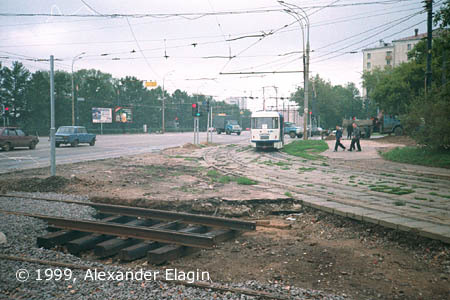 The old line is still in operation in this photo, with a tram running towards VDNKh. 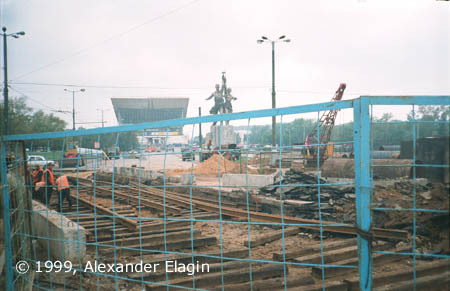 The track works near Kasatkin Street. Here the new line also connected with the old one. This junction did not exist for long, as the next stretch of the line was also relocated a few months later.